Pulse-jet baghouses require properly engineered filter cages and Venturis for optimal performance and service life. Cages must be corrosion resistant, and right-sized for adequate bag support. 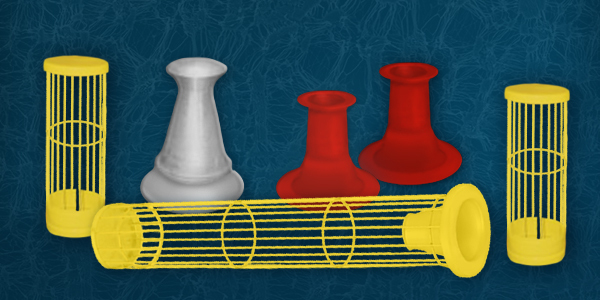 Filter Holdings offers many options for baghouse filter cage construction including basic steel, galvanized steel, or 304 and 316 stainless steel construction with options for 10, 12 and 20 wire construction, in a variety of ring spacing, with options for epoxy and specialty coatings for chemical and corrosion resistance. Venturis must be configured for maximum cleaning efficiency. Our line of Venturis includes options for cast aluminum or steel construction (from a variety of steels) for new equipment, or as replacements. Sizes range from 3" to over 12" to accommodate most application requirements. With our decades of experience and deep knowledge of pulse-jet baghouse operations, Filter Holdings provides expert guidance in choosing from our wide range of filter cages and Venturis to help you select the best options for your application. Filter Holdings also offers options for a wide range of valves, solenoids and gasketing for all dust collection systems.